I saw the "once-in-a-lifetime" call on Photo Friday of the Crazy Hip Blog Mamas and thought, hmm, I don't have any of those. Then after a weekend, and a night of insomnia, it finally hit me, I petted a panda in China. Now, how many people can get to do that in their lifetime? 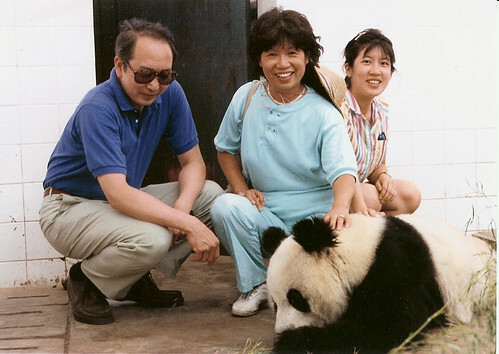 Back in 1988, I went with my parents to visit China. It was the first time in 40 years that they had gone back since WWII. It was a very emotional experience for my mother who saw many changes to her old village and also so many things that hadn't changed. When we went to Beijing, we somehow managed through some connections (nothing happens in China without connections) to visit the Beijing zoo outside of public hours. I was 21 at the time, didn't understand all the Chinese being spoken around me and just went along. The first thing the zoo keeper did was throw in some food, which looked like a brown brick. After the panda started gnawing on it, they told us to go ahead and pet it. My mom was completely thrilled, I was amazed and my dad may have just touched it quickly, but not for this picture. The fur was a lot coarser than I imagined. I don't think the visit was very long, but I'm sure we thanked them profusely. It was definitely a once in a lifetime experience. Wow, that is awesome! What a wonderful experience. Back in 1999, we went to the Washington Zoo, and I was so excited to see the pandas, and wouldn't you know it..it was sleeping curled up in a ball in the corner, so all you saw was the top of his back.